COLUMBUS, Ohio – The Huskies played arguably their best basketball game of the season at the perfect time. No. 9 seed Washington dominated No. 8 Utah State in nearly every imaginable en route to a 78-61 victory on Friday in the first round of the NCAA tournament at Nationwide Arena. The Huskies (27-8) advance to face No. 1 North Carolina in the second round at 11:45 a.m. PT on Sunday. Greg Thybulle — father of Matisse — might be UW's biggest fan. He's definitely the loudest. 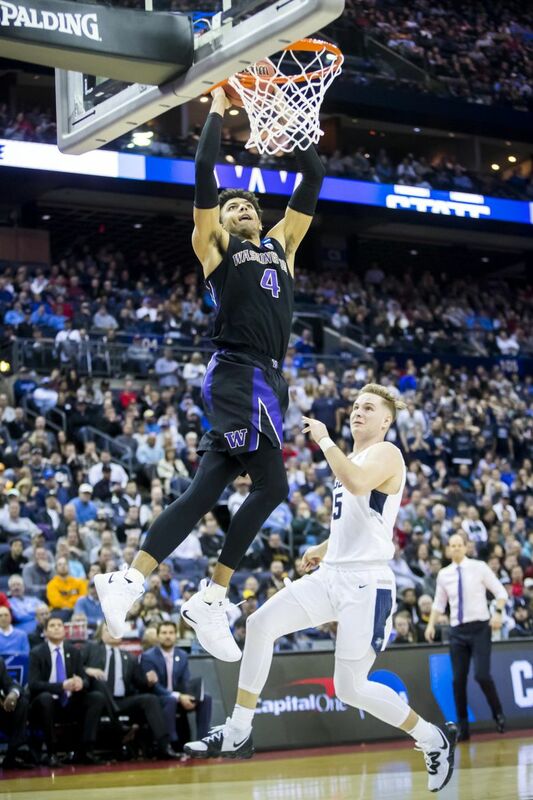 Reports about the death and demise of Washington’s offense were highly exaggerated following a 68-48 defeat in last week’s Pac-12 Tournament title game. It was a season low for the Huskies, but six days later they sliced through, shot over and pounded a stout Aggies defense that entered the game among the nation’s leaders in defensive field goal percentage (34.7). Washington came out firing in the first half and took at 40-28 lead into halftime. The Huskies nearly matched that offensive output in the second half while scoring 38. They shot 49 percent from the field and 58.8 percent (10 of 17) on three-pointers. Noah Dickerson had difficulty anticipating USU’s double-teaming tactics in the opening minutes, but he settled down and finished with 20 points and 12 rebounds primarily against USU’s 6-foot-9 center Neemias Queta. Dickerson converted 7 of 13 field goals and was 6 for 6 on free throws. He also drew seven fouls and rendered Queta, a dangerous shot-blocker with a 7-foot-4 wingspan, ineffective. Dickerson performance was reminiscent of his 25-point performance last year against Arizona big man Deandre Ayton. Meanwhile, Jaylen Nowell was most effective drawing fouls, getting to the line and making 9 of 10 free throws. Whenever UW’s offense stalled, the sophomore guard hit big shots en route to 19 or he made plays for teammates and finished with five assists. In a battle between conference MVPs, Nowell the Pac-12 player of the year outshined Mountain West player of the year Sam Merrill, who had 10 points on 2-for-9 shooting. It was his second-lowest scoring outing this season and 11 fewer than his average. And the Huskies received significant offensive contributions from Nahziah Carter, who scored 13 points and Matisse Thybulle (10). The Huskies’ trademark ballhawking and disruptive 2-3 zone defense was at its destructive best once again. Washington forced 21 turnovers, which was the most in its past 11 games, and scored 26 points off Utah State’s miscues. The Huskies locked in on Merrill, tracked him all over the court and never allowed him to get a good look. The defensive game plan was similar to the scheme UW employed against Utah while shutting down Sedrick Barefield (12 points on 4-for-13 shooting) in a 62-45 win on Feb. 20. Obviously, Thybulle, the Pac-12’s two-time defensive player of the year, played a big part in Washington’s defensive exploits. He was all over the place while tormenting the Aggies with five steals and three blocks. Dickerson and Wright also deserve kudos for defending Queta in the paint and forcing him to miss several shots around the rim. Utah’s freshman center converted just four of 12 field goals. CAN UW UPSET NO. 1 SEED NORTH CAROLINA? The short answer … maybe. The Huskies opened as an 11.5-point underdog and ESPN’s Basketball Power Index gives them a 9.3 percent chance of winning. But if anyone knows how to defend the Tar Heels, it’s UW coach Mike Hopkins, who spent 22 seasons as a Syracuse assistant prior to his arrival at Montlake. North Carolina and Syracuse waged epic battles, especially since the Orange joined the ACC in 2013. The Tar Heels (28-6) have won 16 of their past 18 games, with losses against fourth-ranked Virginia (69-61) and fifth-ranked Duke (74-73). UNC has been a juggernaut for most of the season, but it hasn’t always been perfect. The Tar Heels suffered upsets against Texas (92-89) and Louisville (83-62). And on Friday, North Carolina trailed 38-33 at halftime against No. 16 seed Iona. In the second half, the Tar Heels outscored Gaels 55-35 for an 88-73 win. If Washington can once again play its best game of the season, then the Huskies can move on to the Sweet 16 for the first time since 2010.